The other day, someone asked me if I am a runner. I replied yes, and then said, "I know I don't look like a runner." Ummmm, what? As soon as the words were out of my mouth, I wanted someone to slap me. And I am not one for violence. In fact, our house is a no spanking, no slapping, no hitting zone. 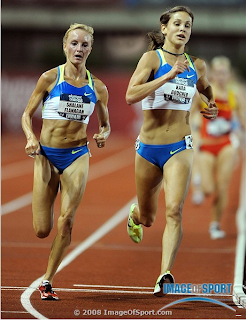 I don't have abs like Shalane Flanagan's, a booty like Kara Goucher's or legs like Paula Radcliffe's. Because of running, I do have a smaller booty, sweet definition in my legs and am working on the abs. But what really matters is I am blessed with a strong, healthy body that allows me to be a runner. And for the record, I do look like a runner. If you've spent much time wandering around the running blogosphere or have lined up next to hundreds (or thousands) of runners at the starting line of a race, you've seen proof that I look like a runner. And you look like a runner. So if those words ever come out of my mouth again, someone please slap me. And if I ever hear one of you say you don't look like a runner, watch out! I'm swinging & slapping right now!! you. are. runner. hear. you. run. those abs scare me anyway. we totally look like runners! You are awesome. Great post. And for the record, I think you absolutely look like a runner! Ummm I still remember your pictures from Hawaii. You look like a runner. But it's easy to get down on ourselves. I know. But I like how you focussed on the positives like being healthy and strong! I hate that when I tell people I'm a runner they look at me like I'm lying. Just because I'm overweight doesn't mean I can't run farther and longer than these lazy, skinny girls. Girl, you totally look like a runner!! Consider yourself slapped!! You are a runner! You are a runner. I am a runner. Never underestimate the running girl who is on the heavy side. Or the running senior who has a head full of gray hair trotting around in her slightly osteoporosis-looking back. Both of them have outran before! I think you look like a runner. Isn't that what's so great about it all? We are one big family and we are all a little different. So true! Runners come in all shapes and sizes for sure. Love this entry. I feel like many of us "stereotype" what a runner should be. Fast, thin..etc. etc.. We all have to kick ourselves, slap etc when we do this! !